Everything bovine is divine, according to the author of this hymn to cows. He has been spell struck since childhood by cows, an animal that he finds endearing in any and all sizes and shapes. In short, this is a love song for the wonderful ruminant and an introduction to our very mooooving subject. The progressive disappearance of cow farming in the Alps could well lead to a return of forests in landscapes and an increase in reverted land in high-altitude meadows. But are postcard landscapes in fact necessary for mountain biodiversity ? A tasty treasure is laying low in the Savoy, the Vacherin cheese. In the Bauges region and the Val d’Abondance, the small, creamy cheeses are still made according to the old methods by a handful of local producers. A rare product, high appreciated by connoisseurs, but threatened with extinction. Is the Swiss cowherd doomed to extinction ? The Swiss dream of the high pastures, but refuse to work there. The solution is to… hire from abroad. The traditional skills and know-how of the mountain workers are now being transmitted to immigrants from Kosovo, Poland, Portugal or Cape Verde. Such is the paradox of an evolving Alpine symbol and tradition, caught between myth and reality. Cows have haunted art since time immemorial. Often a mere onlooker in many landscapes or traditional scenes, cows have also been the subject of portraits thanks to their beautiful eyes. A picturesque ruminant at any rate, in every sense of the term. Here, an overview. What does a cow dream of, while chewing the cud in the sun. What are its emotions, joys and regrets ? 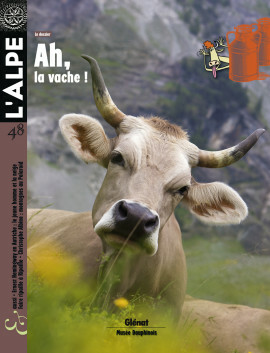 To portray his intimate impressions of the Alps, the author of these very personal bovine memories adopted the identity of Couscous, the queen of the Vaudet high pastures, above the Val d’Aoste. The biggest cows in the world ! Jules Gourdault, a travelling writer, presented his Swiss journeys in two large volumes titled La Suisse, études et voyages à travers les 22 cantons (1879-1880). Far from a simple tourist guide, the book paints a picturesque and vivid image of the country, highlighting the human side. This is an excerpt from a chapter on the local fauna and flora. The cow « ranz », the modest song of the cowherd, first became a very popular folklore tradition, before turning into a Swiss national emblem. The Swiss image of self includes mountains, grass, cows and, as an immaterial and human heritage, a song. At a time when countries are looking for signs of their national identity, in order to better exclude those who do not fit, it is perhaps « fitting » to take a closer look at this cowherd tradition. Useful information for organising a trip, ranging from the high pastures to the stables ! Christophe Albino travelled throughout the Alps as a salute to Polaroid 55, the mythical film whose production has just been halted. Did you say paradoxical ? Chef Chiquart, master cook for Amédée VIII, Duke of Savoy, wrote a unique medieval treatise on cooking. Du fait de cuisine, put to paper in 1420, describes the organisation and the recipes for a 3-day banquet at the château. Held by the Médiathèque in Sion, Switzerland, the book portrays an inventive art de vivre and was recently published by Actes Sud in an adaptation for modern readers, with a fascinating introduction. Excerpts. An unusual image of the future Nobel laureate for literature is Hemingway on skis in an Austrian village in 1924. The peaceful setting was perfect for working on his first novel. In the snow of Vorarlberg, between two fast runs in the powder, a writer was born.